Sunsoft is well known for creating good games for the NES and SNES. Sadly, some of these are unknown, and this is the case for Ufouria. Ufouria is a really great game which was released during the last years of the NES, which is the reason why it wasn't even released in the American region. It was originally released in Japan as Hebereke, and localized in Europe as Ufouria: The Saga, which is the version we are getting in Virtual Console. The story of the game is pretty simple but enough for setting a good context. We are introduced to Bop-Louie, a small boy that looks like a snowman. He lives a place called Ufouria, together with his friends: Freeon-Leon, Shades, and Gil. One day they find a crater through which they fall. Bop-Louie soon wakes to up to find himself in a different place and without his friends, so he sets up on the mission to find where his friends are and how to get back to Ufouria. The gameplay is really easy to understand. 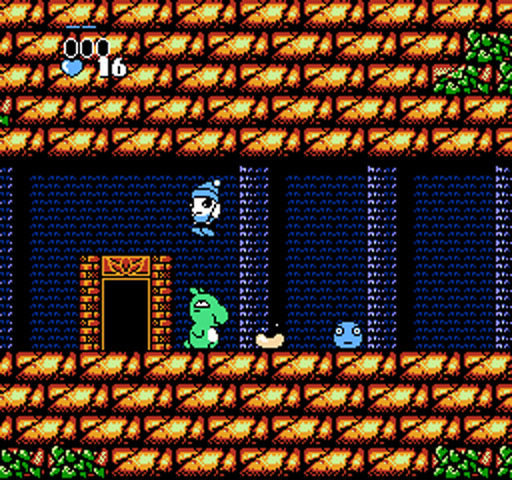 It's similar to Metroid on the sense of exploration and adventure in a big map while on the action part is a bit similar to Super Mario Bros. 2 (USA). The Control Pad moves your character while the A button lets you jump and the B button lets you pick up items and then throwing them. 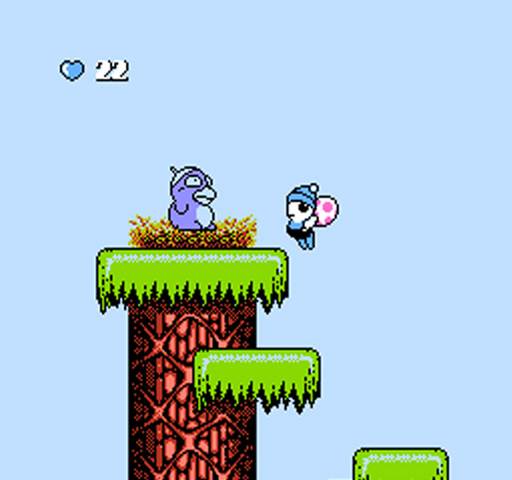 Later in the game, the B also works to do a special attack. Something interesting to point out is that to stomp on enemies, you need to hold down on the Control Pad while jumping, which is a bit confusing when you start the game for the first time. But besides that, there's no things to nit pick about the controls. As I pointed out in the story, you start out the game with only Bop-Louie, but as you progress through the game, you will have to fight your friends who are suffering from amnesia to help them recover their memory. This is done in a special fight in which your opponent and you have the same amount of life and have to hit each other with a funny looking ball a certain number of times. If you lose, you'll end up back outside the room and can retry the fight again. If you win, you help your friend recover his memory and he joins your party. 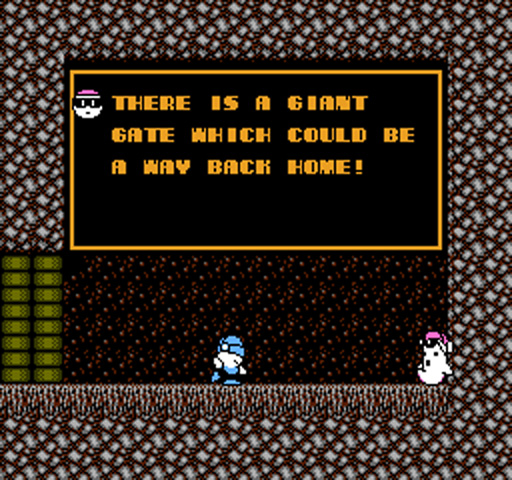 This is an important aspect of the game's gameplay, as each character has different abilities to help you out through the adventure. For example, to enter certain areas, you'll need of a specific character. 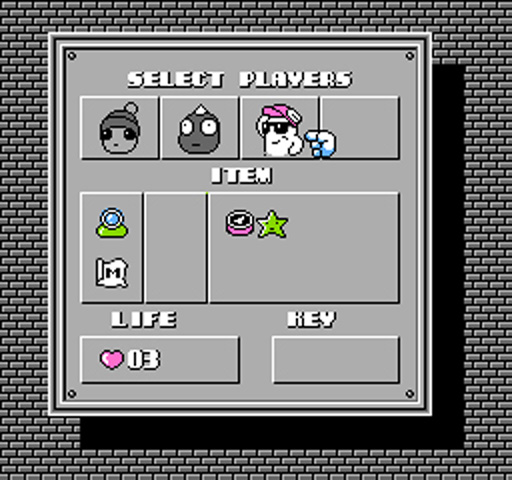 You can easily switch characters by pressing Select to enter a menu screen with your current party and inventory. Graphically, the game is good, using properly the NES hardware. 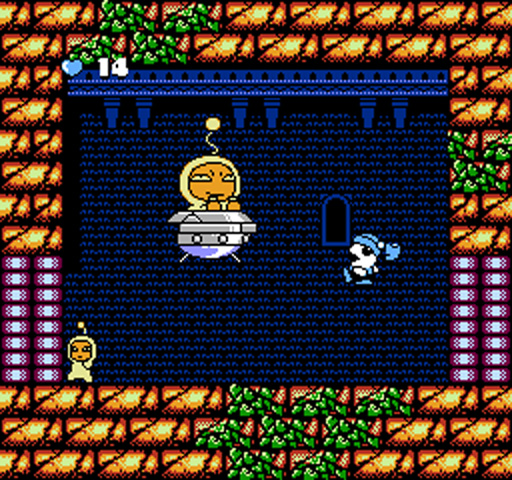 The game uses a silly cartoon/anime style and the sprites are quite detailed and filled with expressions and overall graphics are colorful and with good details. The sound part of the game is excellent. As usual, Sunsoft has delivered excellent music on the NES again. All of the music in the game matches perfectly with the situation and all of them are also quite memorable, even the title screen. And as soon as you start the game, the music will make you feel like exploring the game's world and going out on an adventure. The few sound effects that are used in the game are also used properly and sound good. Ufouria is an incredible game that sadly wasn't released in America until a few years ago on the Wii. With it's memorable music and great gameplay, I highly recommend it to anyone, specially if you are looking for a fun adventure game.